The camel archer is a staple soldier in any army of the Middle East, Africa and Asia. 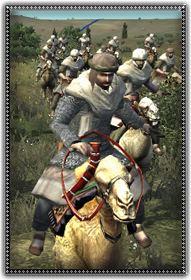 The camel can go for days without rest, and with the ability to hit anywhere and the endurance to bypass troops, this makes for a very valuable asset indeed. Armed with bow and Kattara, the nomadic Bado are invaluable to any army. Living in the barren desert gives these camel nomads a fierce composition and hearty endurance. Used correctly, these masters of the desert can halt any form of enemy.